If you know how to play Blackjack, then learning about Perfect Pairs shouldn’t be that difficult, either. 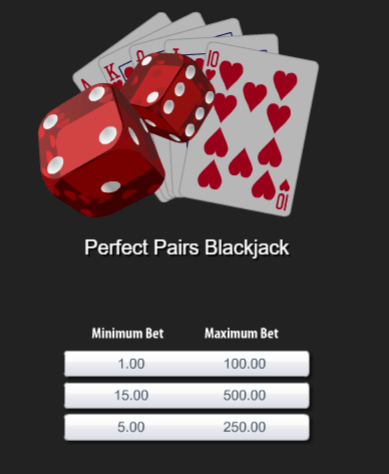 Perfect Pairs is a side bet option in Blackjack that some casinos offer, whether land-based or online. Take note that not all casinos allow this, so make sure that you know the house rules. Most likely, the betting table will have a separate betting area for side bets like this. The rules of Perfect Pairs are simple and based on the original Blackjack rules; betting does not affect the overall outcome of the game. As a reminder, let’s briefly go over the basic rules of Blackjack. Remember, this is just an overview and doesn’t go too much into details. The number of decks may vary depending on the casino. However, most casinos will use 6 decks, shuffling after each game round. The house must continue hit on any total below a total of 16. On a soft 17, rules differ depending on the casino as to whether the house should hit or stand (note: a soft 17 is a hand totaling 17 that contains an Ace counted as 11, i.e. A-6 or A-4-2). Winning on a Blackjack pays out 3:2 if the dealer does not get Blackjack as well. Betting on insurance pays 2:1 if the dealer gets a Blackjack. Winning hands that are not Blackjack pay out 1:1. You may opt to Double Down on your first two cards in order to improve your hand. Some game variants may allow you to double down again after splitting your hand, where the same rules apply. You can split your hand if you are dealt two starting cards with the same value. The hands are then played separately. 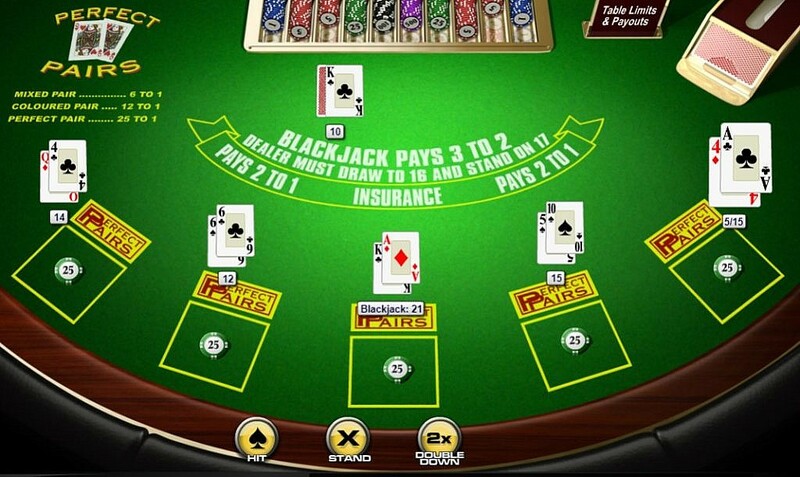 When splitting Aces, most Blackjack variants allow only one additional card to be dealt per hand. When betting on Perfect Pairs, it’s important to remember that the dealer’s cards do not affect the odds of you winning or losing. It all depends on whether your first two cards – and only the first two – are a pair or not. Step 1: First, decide on a bet limit for yourself. Make sure that the amount you bet is just enough so that you don’t lose too much when you don’t get a winning hand. Step 2: Betting for Perfect Pairs must be done before the first cards are dealt. This bet doesn’t need to be equal to your regular bet amount but must be at least the minimum bet amount of the table. Step 3: Once you place your bets, dealing begins. Any wins gained from getting a Perfect Pair are settled immediately after the first two cards are dealt, and then the game continues as usual. Mixed pair or red/black pair: The two cards are exactly alike in face value, but color and suit are different (i.e. a Six of Clubs and a Six of Hearts). Colored pair: The two cards are exactly alike in face value and color, but the suit is different (i.e. a Queen of Hearts and a Queen of Diamonds). Perfect pair: The two cards are exactly alike in face value, color, and suit (i.e. two Tens of Spades). The payout for these wins varies across casinos and the number of decks used. However, the most common is 5 to 1 for mixed pairs, 10 to 1 for colored pairs, and 30 to 1 for perfect pairs. Now that the rules of Perfect Pairs in Blackjack are clear, why don’t you try and give it a shot? The chances of landing a pair within the first two cards are admittedly not sensational, but the added thrill and excitement of knowing you could just get lucky is worth the occasional risk! When you’re ready to try other games, why don’t you check out the rules for Sic Bo or Texas Hold ‘Em? You can also head to OppaBet on desktop or mobile to give it a try. Good luck!